-- none of the bullets have met my accuracy goals, but for what it's worth the 180 and 200 gr. GC have been the better performers, so I'll focus on those weights for a while. If I get bored perhaps I could try a 170 or a 190. -- initially, coated GC seemed to have better velocity variation, but now that I have more data the coated GC seems to vary just as much as uncoated. Since coating does not seem to enhance GC performance in this particular gun, I will transition to uncoated GC. -- a lot of people think crimp is important in magnum wheelgun loads, but I have found that bullet pull is influenced more by neck tension and seating depth. That is especially true in a thin case like the 357. Crimp doesn't seem to make a noticeable difference in this 357. -- at the beginning of this project I was using a 0.354" expander plug, but somewhere along the way switched to a 0.3565" expander plug. I like the 0.354" expander for hard bullets, but I made the 0.3565" plug when I was playing with coated air-cooled plain base so they would not get damaged by excessive neck tension. I'll transition back to the 0.354" expander because increased neck tension might help with the lousy velocity variation that I've been seeing lately. -- not surprisingly, best accuracy seems to be with the bullet seated as far out as possible, so from now on I will design bullets with that in mind. -- even though crimp does not seem to matter in this gun, I would still like to have the option of crimping, so I will transition to bullets with a real crimp groove. -- I can think of 3 things that might explain the diagonal dispersion. 1) trigger pull moving the gun (but mostly side to side, not up and down) 2) variation in grip changing how the gun moves in recoil, particularly if the grip is such that the gun twists in recoil rather than coming straight back 3) wind. Yes, wind affects vertical as well as horizontal. The prevailing wind on my range is from 3 - 5 o'clock and that would do it. However, even targets shot in calm conditions still show the diagonal dispersion, so I can't blame it all on wind. With regards to trigger pull and grip, there is no substitute for practice. This project should help me get back "into shape" for handgun shooting. -- I've generally had better luck with bevel base bullets than with square plain base bullets, and that trend seems to continue in this gun. At a minimum the BB are no worse than square plain base. -- some bullets recovered from the berm showed grooves nearly wiped out. To be sure of what is happening to the bullets I need to fire them into my water tank -- only problem is that water tends to be frozen at this time of year! I'll try to do some water tank tests on the next above freezing day. In general, I don't think this gun is shooting as well as it should. I don't expect it to shoot as well as a line-bored revolver, but it should shoot better than the average factory revolver. My expectation is 2 - 3 MOA. Maybe it is not up to the job, but I'm going to try. I finally got around to fixing the sticky bolt. 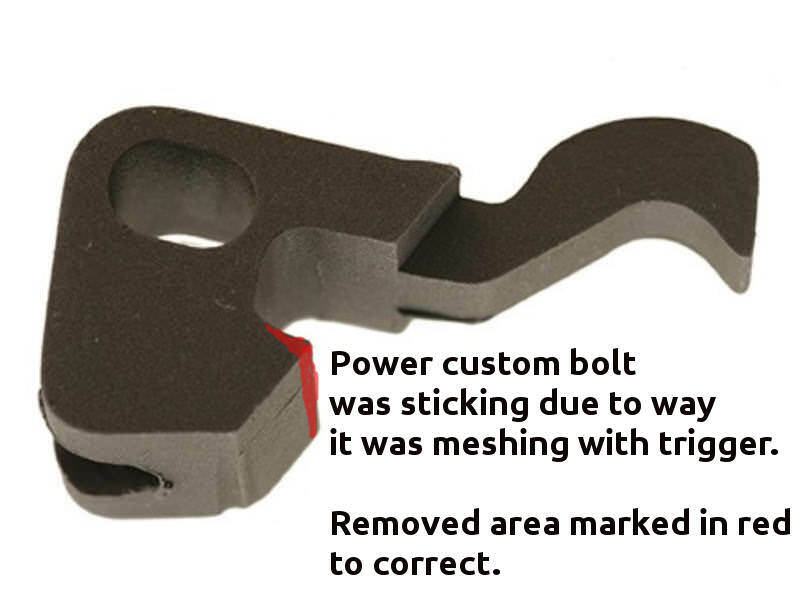 The way the bolt fit the window was fine, the problem was how it meshed with the trigger. 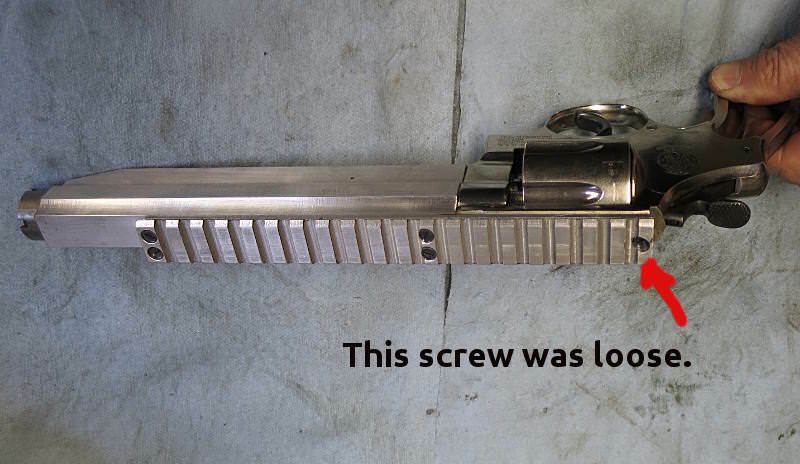 When un-cocked, the trigger was pushing the bolt part way down so the cylinder did not lock reliably. Some stoning in the marked area fixed that problem. While I had the gun apart, naturally I checked to make sure the scope base screws were still tight. The rear screw was completely loose. Closer inspection showed that its homemade nut had broken into two pieces -- apparently I did not temper the nut sufficiently after hardening it. The bottom half of the nut still functions as a nut so I snugged it and applied a drop of crazy glue. Eventually I'll have to make a replacement nut. I can't imagine that the one loose base screw would have any impact on accuracy. The main purpose of that rear base screw is to keep the shroud centered with the frame while tightening the barrel nut. Once the barrel is tight the rear base screw is no longer needed. 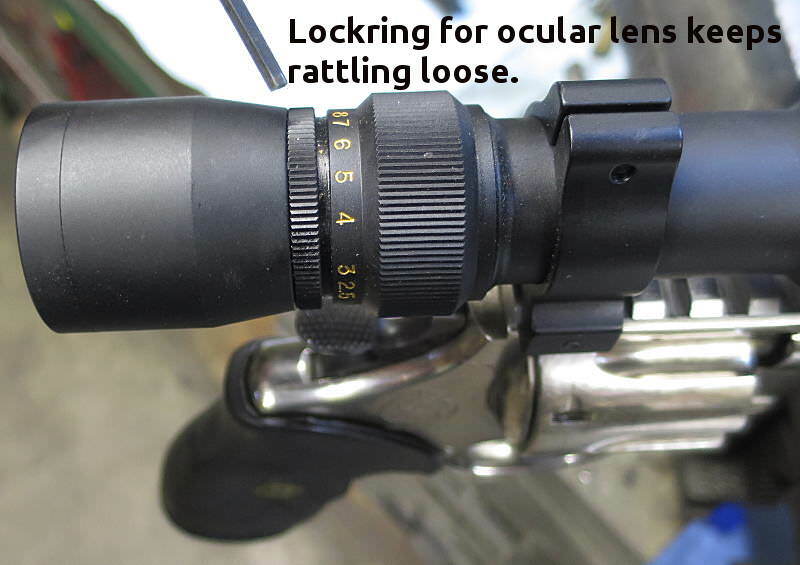 Midway through yesterday's range session I notice the lock ring for the Weaver's ocular lens had rattled loose. I retightened the lock ring and continued shooting. Today while I had the gun in the shop I noticed the lock ring had once again rattled loose. Well, that can definitely affect the point of impact. It allows the ocular lens to wobble and that in turn makes the cross hairs wobble. The loose lock ring is a common problem on target guns that get shot a lot. In the past I have often secured the lock ring with a piece of masking tape or electrical tape -- ugly but very reliable. For now I put a small drop of crazy glue on the lock ring / eyepiece juncture, on the bottom of the scope where it will not be seen. But if the lock ring rattles loose again I may have to resort to the ugly tape remedy. It was a snowy December day so I stayed indoors and prepped some bullets. A nominally 190 gr. gas check bullet, actual weight 188 grains because the bore riding bands weigh less than groove diameter bands. Same basic design as before except with a proper crimp groove. It's a full blown Loverider, with every other band at bore riding diameter. I've had good results with Loveriders in rifles but it remains to be seen if they are a good choice for revolvers. 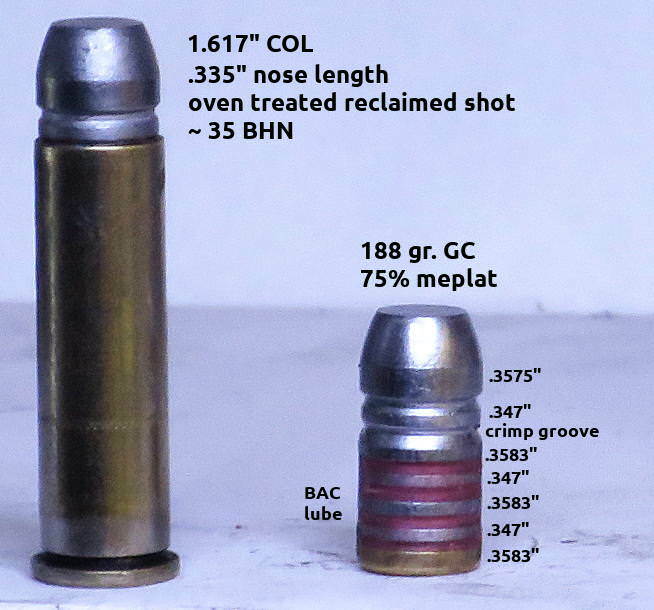 Bullets were nose sized in a tapered die just enough to decrease the front band diameter to 0.3575", for reliable chambering in the 0.358" throats. Sometimes you get lucky and the front band will drop out of the mold with the perfect diameter, but this one dropped with the front band at 0.358"+. If I didn't have the nose die I would be forced to size the entire bullet to 0.3575". Range conditions were mostly good except that the light was so bright with the afternoon sun reflecting off the snow that it made the image in the scope too bright. 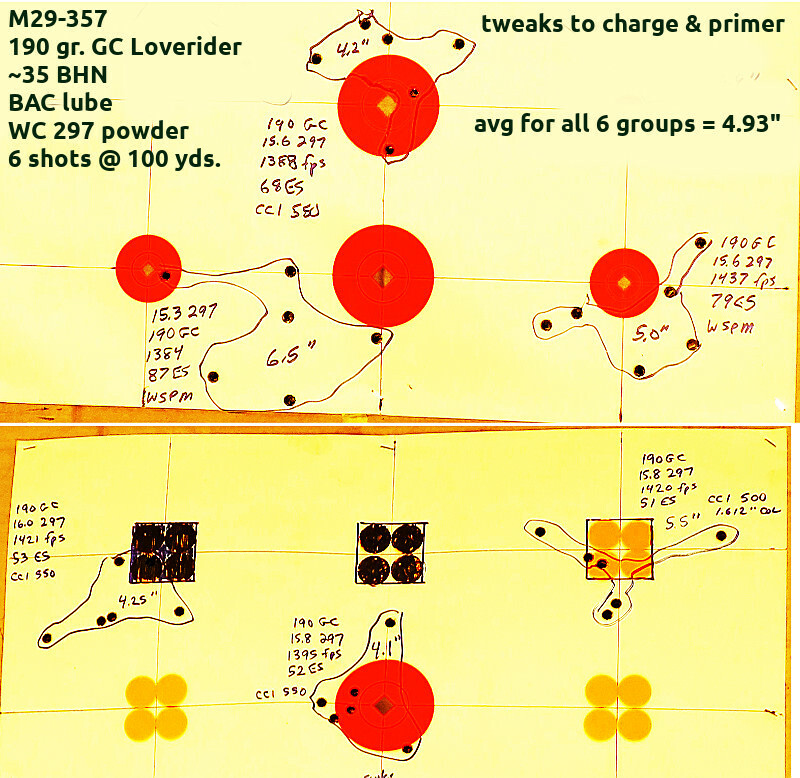 The light orange dots were washing out in the bright light hence I had to darken some of the aiming points. Accuracy was nothing to brag about. The Loverider did not fail, but it didn't do anything noteworthy, either. All of today's cases used a 0.354" neck expansion mandrel for maximum neck tension. All received a moderate crimp (this particular crimp die will bulge the cases if I crimp too hard). I tried tweaking the powder charge. Quickload had predicted 1414 fps @ 30 ksi and I did not attempt to exceed that velocity by much. Then I tried different primers. I could see the crosshairs wobble at least an inch, sometimes two inches, as I squeezed the trigger. The M29-357 is light on the muzzle end due to its aluminum shroud and the scope being slid all the way back to deal with the eye relief problem, so the muzzle does not want to sit still. So the guy behind the trigger is adding at least an inch, maybe two inches to the groups. That said, at no point did the 190 GC act like it wanted to shoot one ragged hole. The 190 GC spit a GC today. The GC fit could stand to be tighter. -- CCI #550 was 49 fps slower than WSPM with same 15.6 gr. charge. -- CCI #550 was 25 fps slower than #500 with same 15.8 gr. charge, however the #500 load was seated 0.005" deeper so it was not an apples-to-apples test. Based on this limited data it looks like CCI #550 might be the best choice, but there isn't enough apples-to-apples data to be sure. I have a confession to make -- I've been shooting mixed brass. In fact, I've been shooting mixed brass in the 357 forever, and it hasn't been an issue until now. But because I'm not happy with the M29-357's velocity variation, I'm looking closer at anything that might cause velocity variation. Here is a sample of case capacities. I only measured one of each type case. How much velocity variation is that causing? Thanks to Quickload, it's easy to estimate. QL says today's 15.8 gr. charge would produce 1441 fps in the nickel WW case but only 1393 fps in the nickel R-P case, a 48 fps spread! Oops! So in theory, I could reduce my ES by 48 fps if my cases were uniform. Of course, even if I segregate cases by brand, there will still be variation from case to case (unless I want to shell out for Lapua cases ). The next step will be to measure the capacity of 10 cases of each type, to estimate how much variation there will be if I segregate cases. -- nothing rattled loose today. The ocular lens lock ring stayed put, and the rear scope base screw seemed to stay snug. -- I started out using 1.617" COL but occasionally a nose would drag on the barrel. I'm guessing that I forgot to allow for excess headspace. Say there is 0.005" excess headspace, then the 1.617" cartridge could protrude 0.002" from the 1.620" long cylinder. I switched to 1.612" COL and did not experience any more nose dragging. -- to help with the wobbling muzzle, I could replace the aluminum shroud with a brass shroud? Or make a brass or steel "sled" that screws to the shroud? -- I like a 190 gr. 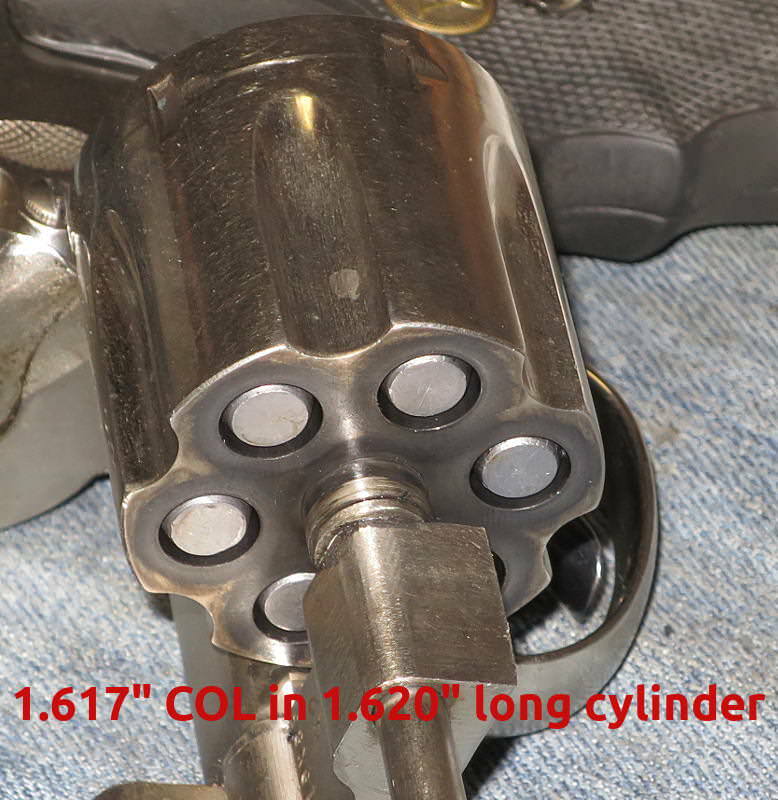 weight for the 357 -- it's about as heavy as you can go without losing a lot of velocity -- but the gun does not seem excited about the Loverider design. -- so I will recut some of the bore-riding bands to make them full diameter bands. Also recut the check shank a little larger while I'm at it. -- but first I want to shoot the 190 GC into the water tank to see if it has anything interesting going on. -- continue investigating case capacity variation. Possibly segregate cases. -- possibly make a "sled" that screws to the shroud, to reduce muzzle wobble. I measured all the fired empties that I had on hand (43). There was a 2.4 grain spread in case capacity. Plugging those case capacities into Quickload provides an estimate of the resulting velocity variation. I assumed a load of 15.6 WC297 pushing my 188 gr. GC. Expected velocity spread = 107 fps due solely to variation in case capacity! Let's say that I decide to use only the R-P cases, which have a 0.9 gr. spread. Then there would be 36 fps variation due solely to case capacity variation. 36 fps is still a lot of variation, but it's better than 107 fps. Would it help if I sorted cases by weight? Not really. There is a correlation between weight and capacity, but it's a weak correlation. 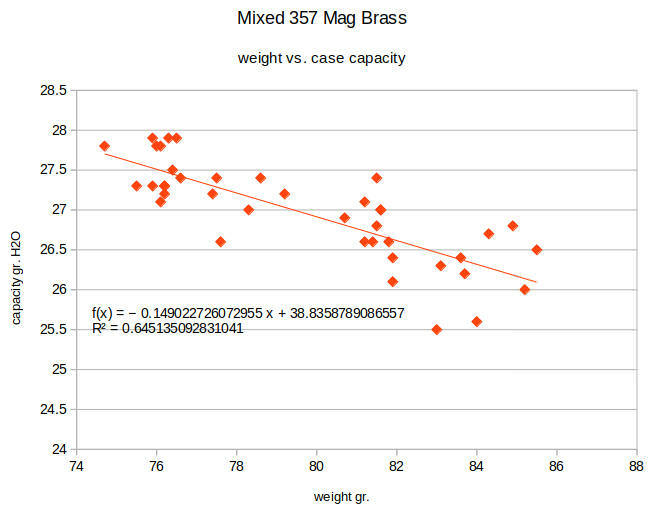 Mixed brass might not be a big deal in a larger case like 454 Casull, or in a reduced load that does not use all the powder space, but it's not appropriate for full throttle loads in a small case. I'll look into ordering more brass for this project. Despite freezing temperatures, I filled the water tank just long enough to test a few rounds from the M29-357. First up, the coated 160 gr. plain base "Loverider," pushed by 17.0 gr. WC297 for perhaps 1533 fps. These reclaimed shots had been quenched after baking. I did not bother to measure their hardness but based on past experience is would have been about 25 BHN. The two photos show opposite sides of the same bullet. At first glance it appeared to be evenly engraved, however if you look closer you see that bore riding band is not engraved at point #1, but is engraved on the opposite side of the bullet at #2. 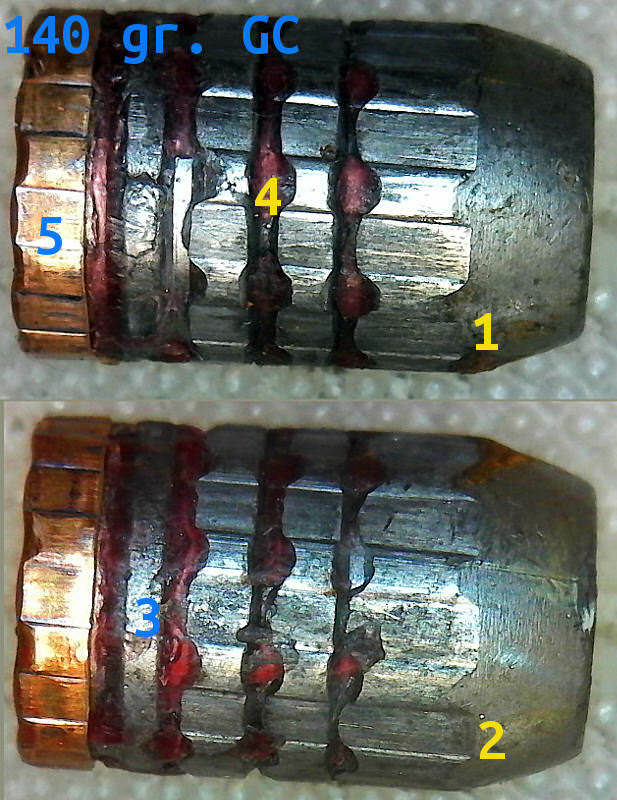 Likewise the front band is engraved less at point #3 than on the opposite side of the bullet at point #4. Point 5 is also a bore riding band, but it seemed to obturate enough to engrave deeply. It's not practical to measure these itty bitty bands, but visually it does not appear to be groove diameter -- perhaps it is 0.354" - ish? My lesson from this bullet is that the bullet did not fail, however the gun must have some throat-to-barrel misalignment despite my best attempt to correct that misalignment by offsetting the barrel tenon. In hindsight, perhaps the diameter of the bore riding band #1 & 2 should have been a little larger. The diameter of the bore riding band at point 5 was less critical since it obturated, anyway. Yes, Virginia, BHN 25 does obturate at modest handgun pressures. The 160 gr. plain base TC bullet that was design for my Ruger Speed Six Snubby. Cast of reclaimed shot and quenched after baking for roughly 25 BHN. 17 gr. WC297 for perhaps 1533 fps. The two photos show opposite sides of the same bullet. The front band of this bullet had engraved very unevenly in the Ruger, perhaps due to cylinder-to-barrel misalignment, but the engraving appears to be even when fired from the M29-357 (points #1 and #2). If I had only looked at this bullet I might have concluded that the M29-357 has perfect alignment. 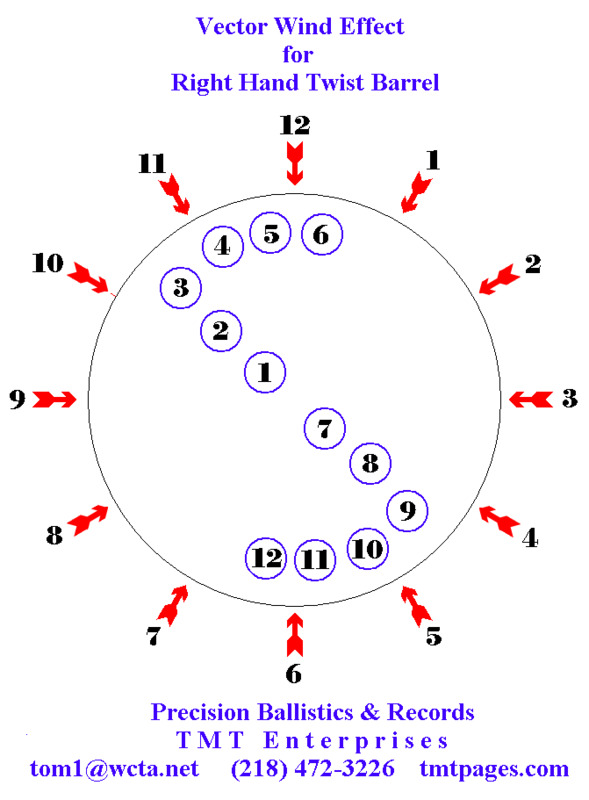 There is only minimal skidding at points #1 and #3. I credit this to the hard alloy and to seating the bullet out so that it did not have to jump far. 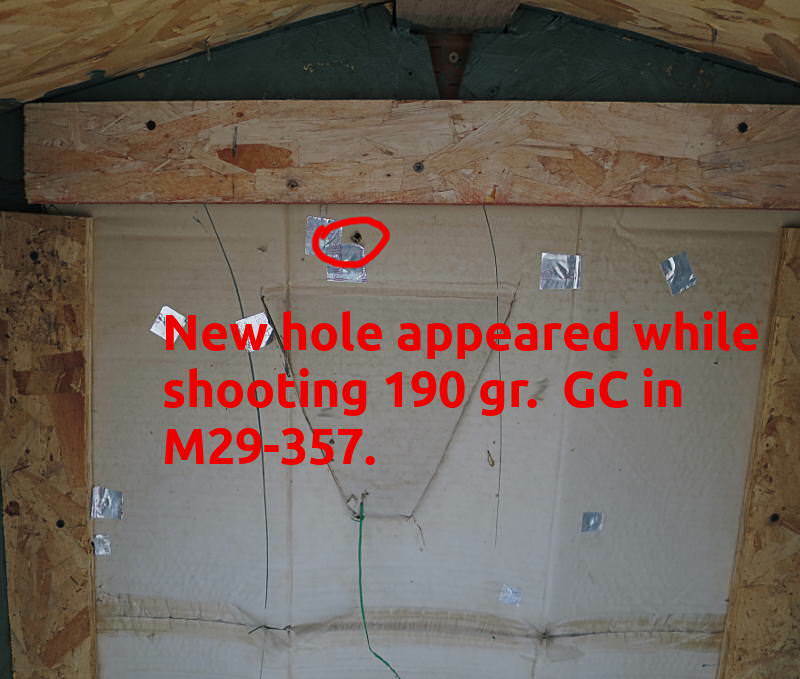 The grooves are wiped out at point #3, presumably due to pressure generated when the bullet slams into the forcing cone. At point #4 the groove is mostly intact. Note the spots where the coating has rubbed off. Sometimes it may rub off due to impact or abrasion, but in general it rubs off at pressure points. 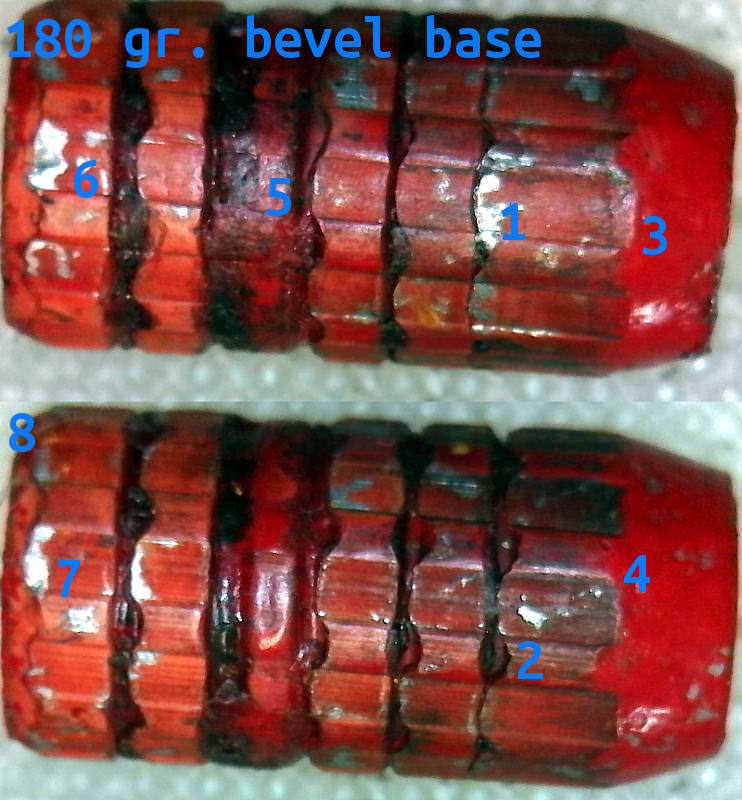 This bullets shows bare spots on the bottom band, presumably due to gas pressure and heat, and bare spots at point #3, presumably due to severe obturation pressure as the bullet slammed into the forcing cone. My takeaway from this bullet is that it might benefit from either a bigger groove and / or a bore riding band in the vicinity of point #3. Perhaps simply increasing the size of the crimp groove would relieve some pressure at point #3? 180 gr. bevel base, pushed by 15.6 gr. WC297 for perhaps 1425 fps. Quenched reclaimed shot for perhaps 25 BHN. The photo shows opposite sides of the same bullet. 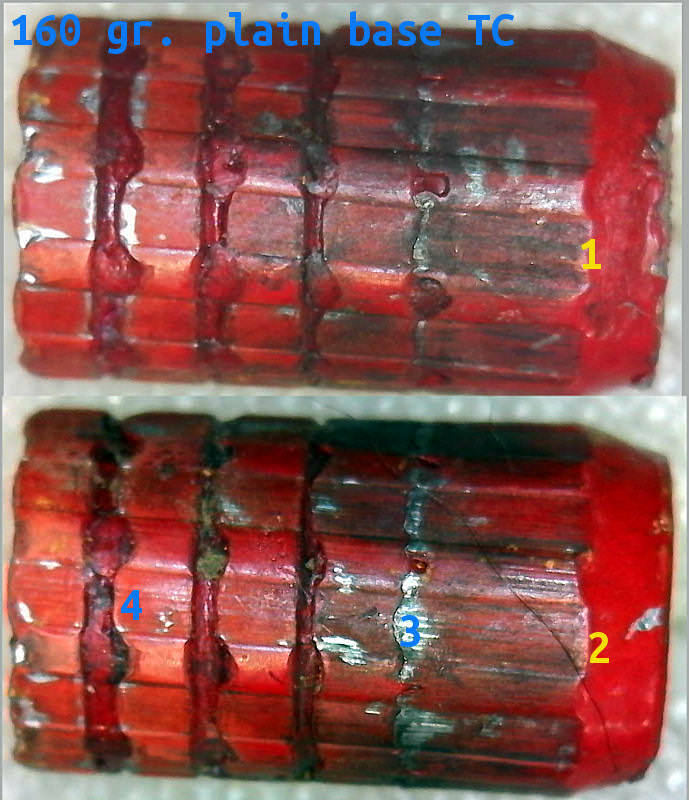 The groove at point #1 has been wiped out more than on the opposite side of the bullet at point #2, and the front band is engraved a little longer at point #3 than on the opposite side of the bullet at point #4, suggesting that the bullet was slightly misaligned when it entered the forcing cone. The misalignment was not severe, but it's there if you look closely. The bullet had a single bore riding band at point #5. The bore riding band barely grazed the rifling so perhaps its diameter should have been a hair larger? But there is no evidence that a bore riding band was needed at that spot. Bare spots at #1 suggest high pressure due to deformation as the bullet slams into the forcing cone. Bare spots at #6 and #7 are probably due to heat and pressure from the powder gases. The bevel base #8 survived with surprisingly little damage. Flat base bullets had a distinctive "fin" around the edge of the base due to engraving but the bevel base does not have a fin. My takeaway from this bullet is that rather than a bore rider at point #5, it might benefit from a bore rider or larger grooves in the area of point #1. 140 gr. GC, oven treated reclaimed shot for ~35 BHN, pushed by 19.5 gr. WC297 for perhaps 1703 fps and perhaps 29,000 psi. You have to look closely, but to my eye the front band is engraved further at point #2 compared to the opposite side at point #1. This bullet had one bore riding band at point #3, but it barely grazed the rifling in a couple of spots, and apparently the estimated 29,000 psi peak pressure was not enough to obturate the 35 BHN bore riding band. There does not appear to be any need for a bore riding band at that location, anyway. The BAC lube mostly remained in the grooves (point #4). Some people believe that a bullet lube should squirt or fling out, but that has not been my experience. 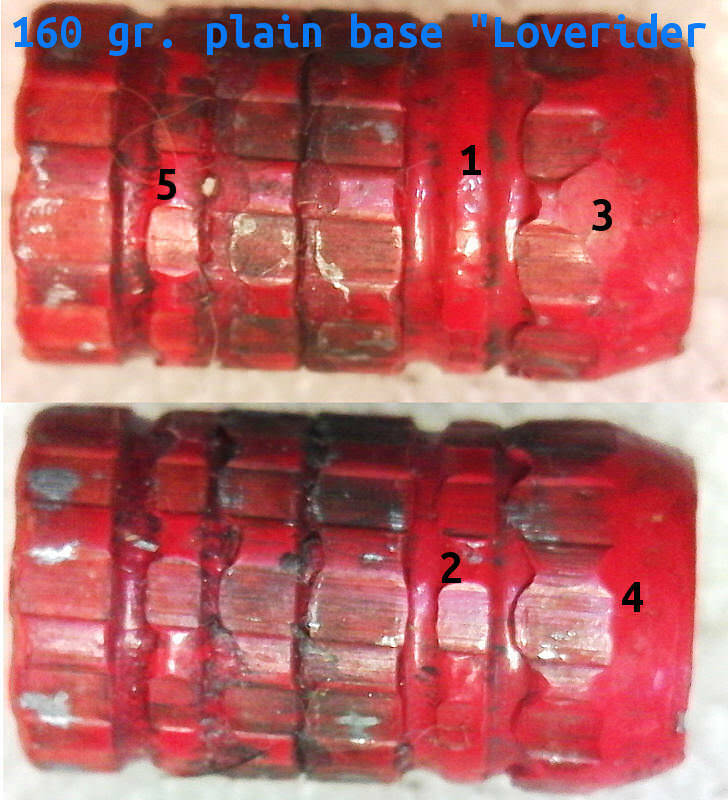 Recovered bullets are often missing their lube, but that can be due to abrasion upon impact. Over the years I have recovered enough bullets that still held lube to come to the conclusion that that is perfectly normal and OK.
As it happened, the gas check was a loose fit on the shank as the bullet dropped from the mold, nonetheless the gas check (point #5) remains firmly attached. Sometimes the shank obturates enough to create a tight fit, plus engraving tends to help lock the check onto the shank. My takeaway from this bullet is replace the bore riding band at point #3 with a groove diameter band. The only groove that suffered serious damage was the crimp groove so perhaps increase the size of the crimp groove?